I'm always amazed by hummingbirds! Arachnid, I'm sorry for your loss. I hope that you find comfort in your special memories of your Dad and of all the good times you shared. Amazing and beautiful story, Kathy. Everybody!! We have a hummingbird feeder right outside our family room patio door. Enjoy watching them so much. Geez! Had a bad time with Medium, now I completely screwed up Easy. Guess I should go back to bed!! Was this the ''Big event coming up this week'' or is there something else you are keeping from us? Morning all,one of nal's beautiful photos. Kathy, what a beautiful memory of your Mom's passing. Kathy, as my favorite Aunt at age 89 lay dying and struggling to breath in the hospital, she looked at my cousin and me with a big grin on her face and said, 'I've had a blast!' and died about an hour later. I hope I can say that at that time! Lovely hearing the sad but cheery words of those loved ones who had great presence of mind as they neared the end. I cannot say enough about hospice care that my Mom received during the last 7 months of her 95 years of life. So sorry for your loss, Arachnid. No matter how old you are, you are still a child of theirs when it comes to missing them. Peter, make sure you blow out all the candles they don't need another fire in Tassie. Good mAen, good people. (I'll cram a lot into one post and give Keith a bit more time.). Happy birthday, Peter!! I'm a bit impatient. So much to do and I'm sitting at an art center while Skye takes an art class. I wonder if I can take a nap? 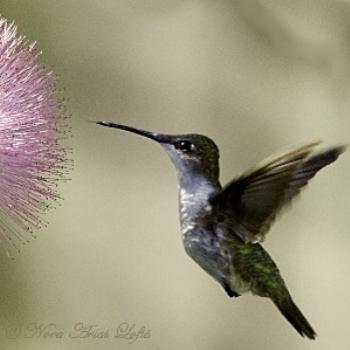 Hummingbirds are a joy to have around, and watching them is a great experience. In the morning when I run I usual meet the same characters out for a run, walk, or bicycling. One dear character was Bobby on his bike. I just found out that he had just passed a month ago which shocked me because I saw him out bicycling a couple of months earlier. He was 93 years old. I think I would rather live in Hobart than Canberra at the moment. Apart from the lovely city and the gregarious locals, it has been doing better in the weather stakes than we have. Thirty nine celsius today and 40 tomorrow, Australia Day or Invasion Day as our Aboriginal citizens prefer to call it. We have arrived at 'beer o'clock' so raise your glasses and drink to Peter's birthday. Down the hatch is probably the most appropriate salute. The big event has arrived and thanks everyone for the birthday wishes. There's a total fire ban here in Tassie so no candles. Splice the mainbrace would be good, Wombat but down the hatch is OK too. These five geriatric jokes are not intended to reflect on Peter's advancing age. Got my errands done and snug as a bug in the house. Hey, look, two new members finally knocked Wagdi off, who, since he is Wagdy, did not really belong on the list.